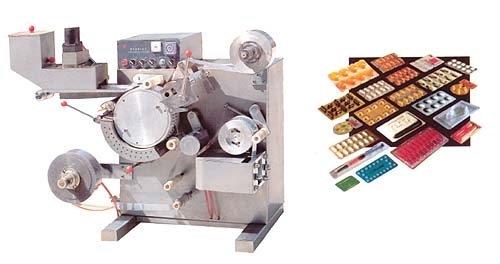 New Mini Blister Packaging Machine Model DPT-80. Features: Fine drum-type heat seal performance, transverse none waste edge clicker, correct synchrony, simple structure, complete function, easy mould removal convenient operation, strong stability. Suitable for blister type AL/PVC composite seal package, as well PVC hard sheet and DPT aluminum foil packaging. Punching frequency: 30times/min/plate each punching Max Plate size:	135×80mm(Designed according users requirement) Packing material: PVC hard piece: width65-70mm,thickness 0.25-0 .30mm, bore diameter of rolling shaft60-70mm PTP Aluminum foil: width65-70mm,thickness0.02-0.025mm,bore diameter of rolling shaft60-70mm Power consumption: 5kw, 1Ph/60Hz/220Volts Overall size L×W×H(mm): 1150×500×950mm / Weight: 180kg Includes 1 Set of Moulds customer to specify. Delivery: approx 8 weeks from receipt of 65% deposit.